You may wish to read an introduction to this section or a page describing the location of Chioggia or its churches first. 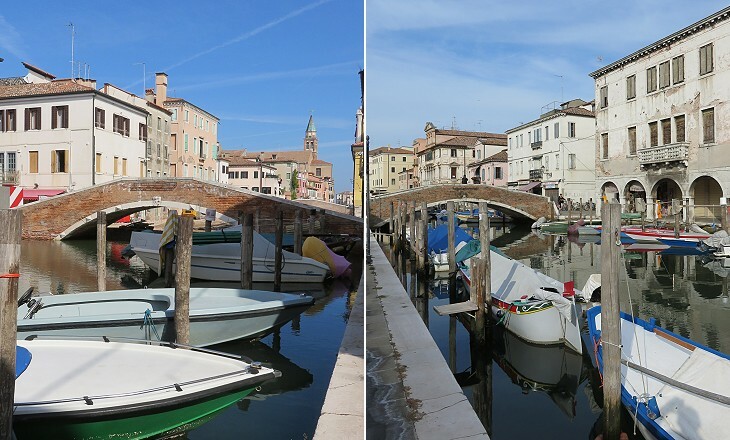 In the last decades municipal authorities of Chioggia have been confronted with a difficult choice between maintaining the "built on water" historical aspect of the town and acting to reduce the exodus of its inhabitants to modern houses on the mainland. 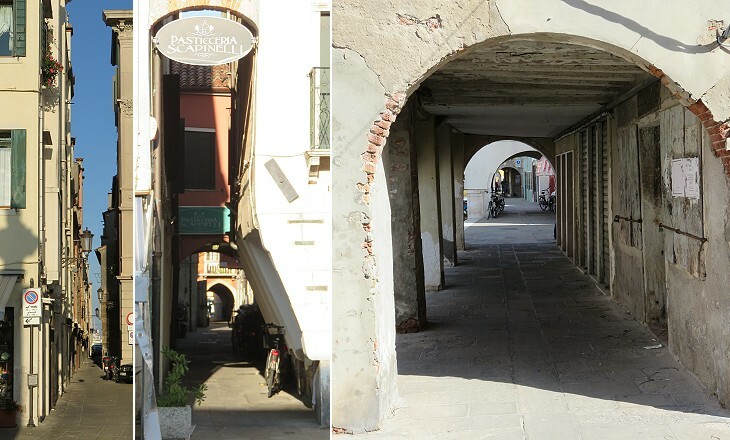 Passages for cars and motorbikes have been created along the two side canals of the town to improve mobility, but Vena, the main canal, retains its "Venetian" appearance, especially in its northern section. Chioggia cannot compete with Venice in many respects, but it does have a large, long and straight street which Venice does not. 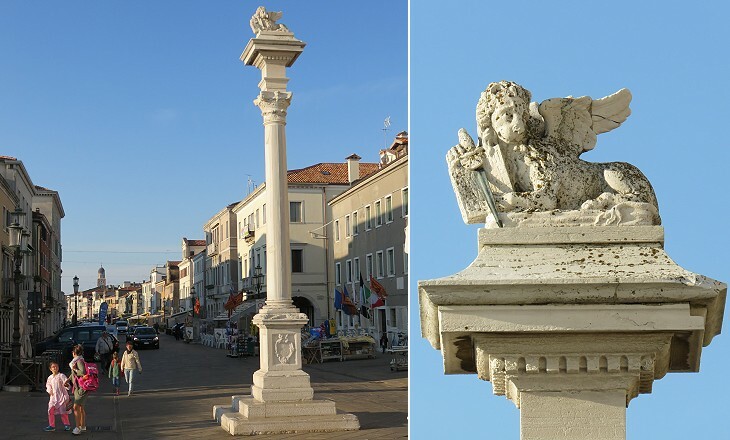 In 1763 an ancient column was found in the foundation of a medieval building and in 1786 it was placed at the northern end of Corso del Popolo, where the boats from Venice moored. 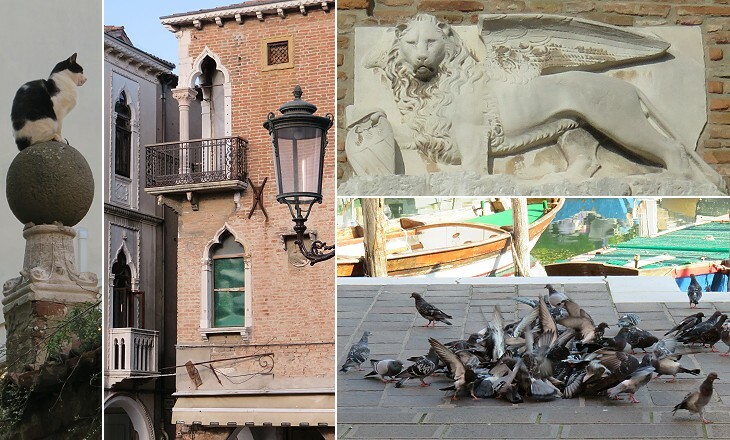 The Lion of Venice which was placed at its top was such a poor work that the Venetians nicknamed it El Gato de Ciosa (The Cat of Chioggia). 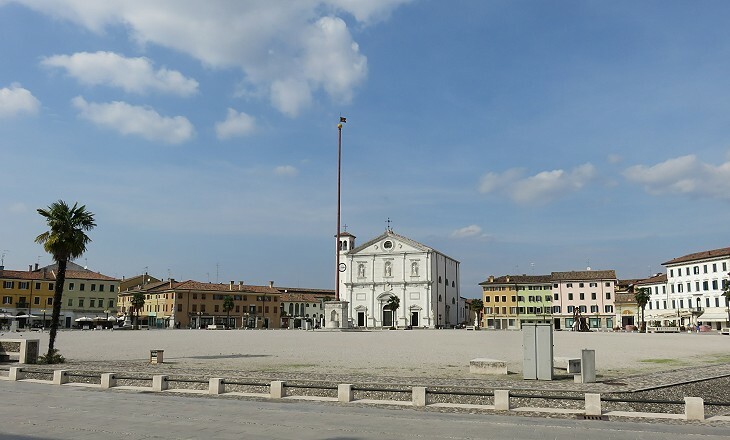 The width of Corso del Popolo is such that by applying the standards of Italian historical towns it should be called a piazza rather than a corso and as a matter of fact in the past it was popularly known as la Piazza. It is generally assumed that it stands on the cardo (main north-south street) of a Roman vicus (village) mentioned by Pliny the Elder. Every year at the end of June it houses Palio della Marciliana, a series of events including a costume parade that celebrates the liberation of the town from the Genoese in June 1380. Marciliana is the name of a medieval merchant ship of Chioggia which had a rather round shape. 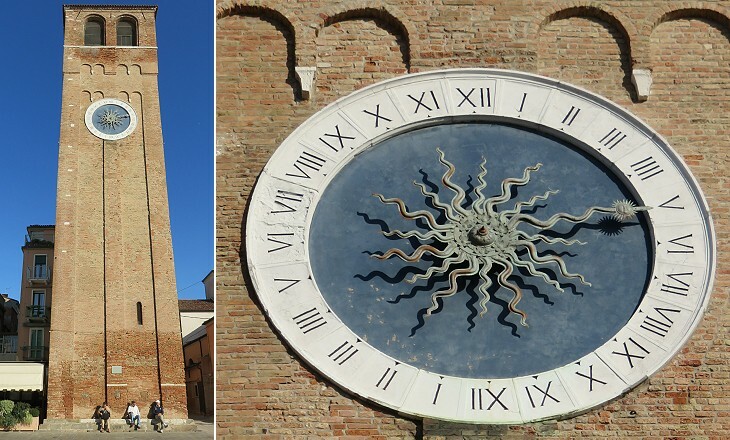 The bell tower of the nearby church of S. Andrea became known as Torre dell'Orologio after 1839 when a medieval clock was placed on it. It is similar to those of the Cathedral and of S. Domenico which are shown in another page and it was most likely built in the XIth century. The clock was made in 1386 and it stood on a tower of the old Town Hall which was demolished after a fire in 1817. It is regarded as the oldest or one of the oldest town clocks. In 1789 the numbering of the hours in two series of twelve replaced the traditional Italian Hour (which was based on six hours). You may wish to see a similar clock at Spalato. In 1713 a new base for a very tall flagpole was built near the medieval Town Hall (which was replaced by a dull building in the XIXth century). 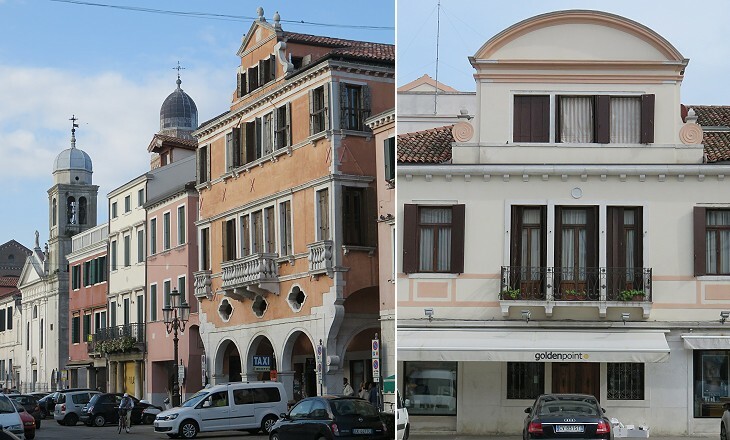 Very tall flagpoles can be seen in other towns of the Republic of Venice such as Palmanova (it opens in another window). 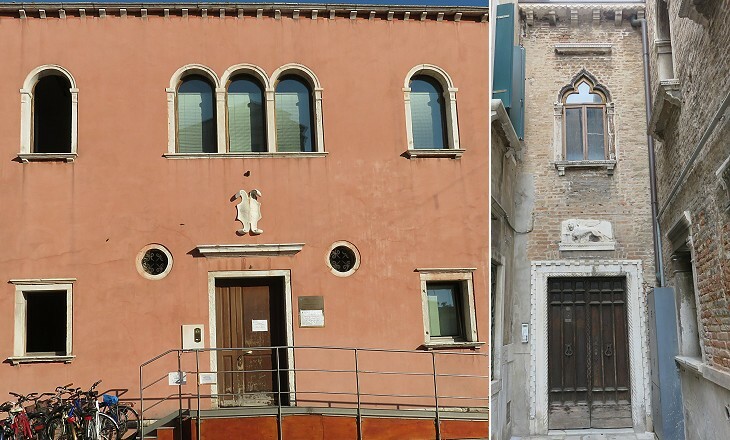 Some of the most important Venetian families had palaces in Chioggia. Giovanni Morosini was podestà (governor) of the town in 1662. The best known member of the family is Francesco Morosini whose name is associated with the long defence of Candia and the successful campaign in mainland Greece which in 1687 led him to fire on the Parthenon in order to conquer Athens. Sebastiano Renier was another podestà of Chioggia. The Renier family had a palace at La Canea on Crete and Giovanni Renier was governor of Cyprus in 1552. Palazzo Renier was the residence of the Grassi family before they moved to a new palace (see below in this page). At last I have seen a real comedy! At the Teatro San Luca today they played "Le Baruffe Chiozzotte" by Goldoni. The title might be roughly translated as "The Scuffles and Brawls in Chioggia". The characters are all natives of that town, fishermen and their wives, sisters and daughters. (..) I was in Chioggia only yesterday, so their faces were still vivid in my mind's eye and their voices still ringing in my ears. I enjoyed the play immensely. J. W. Goethe - Italian Journey: Venice, October 10, 1786 (translation by W. H. Auden and Elizabeth Mayer). Carlo Goldoni (1707-93), the best known Italian playwright of his time, spent part of his youth at Palazzo Poli in Chioggia. This experience enabled him to write the comedy which Goethe so much enjoyed. The urban layout of Chioggia resembles a fish skeleton where Corso del Popolo is the spine and all the other streets (calle) are the ribs departing from it. They are very narrow with the exception of one which was enlarged to allow the passage of two cars at the same time. 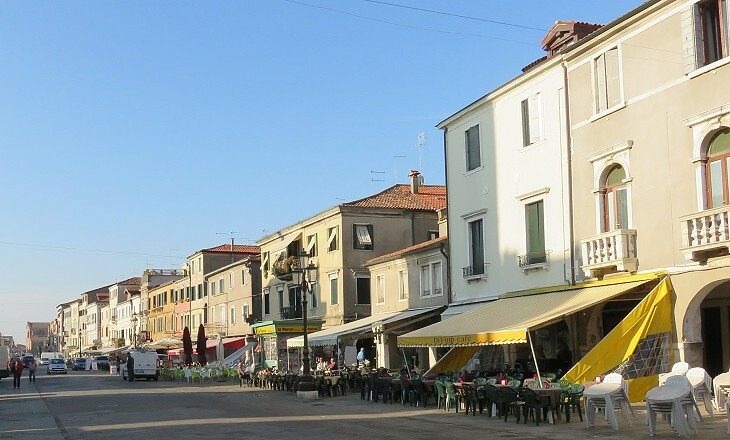 The use of the term calle is not limited to Chioggia and Venice, but can be found at Grado and other towns of the Republic of Venice. The term fondamenta indicates a street on the side of a canal. 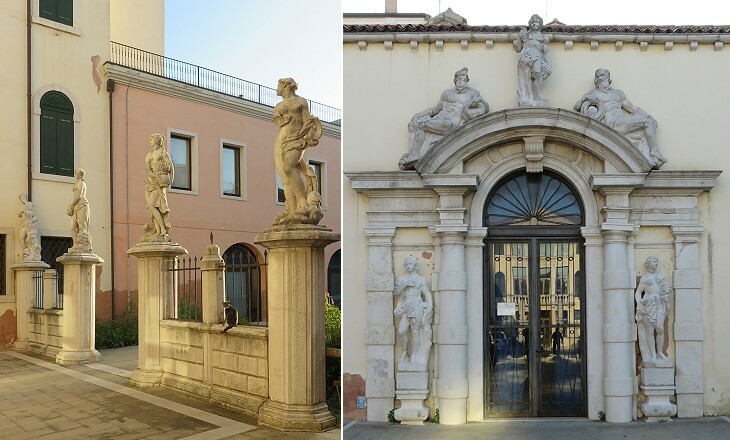 Some of the palaces on Corso del Popolo had a second entrance on Canal Vena for those who arrived by boat. In the XVIIIth century this was perhaps the main entrance, but today most of these entrances have been closed in order to minimize the impact of acqua alta (high water), the rise of the water level which occurs when strong southern or eastern winds push sea water into the lagoon. 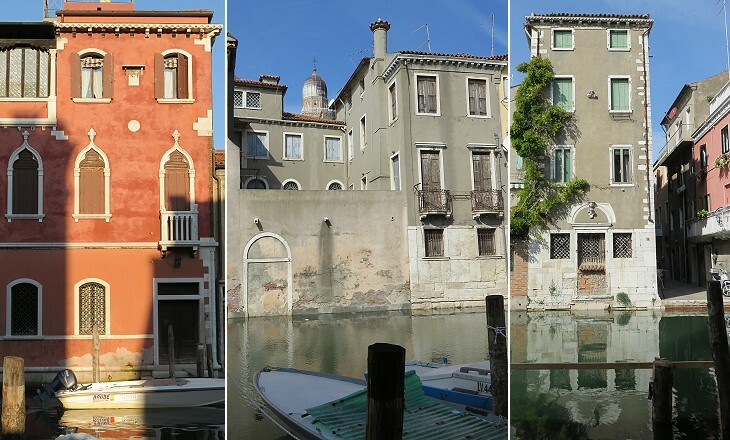 Fondamenta Canal Vena was most suited for housing palaces of important families, because they could be accessed both by boat and by foot. The Grassi were a family of rich merchants of Chioggia who were eventually accepted by the Venetian aristocracy. 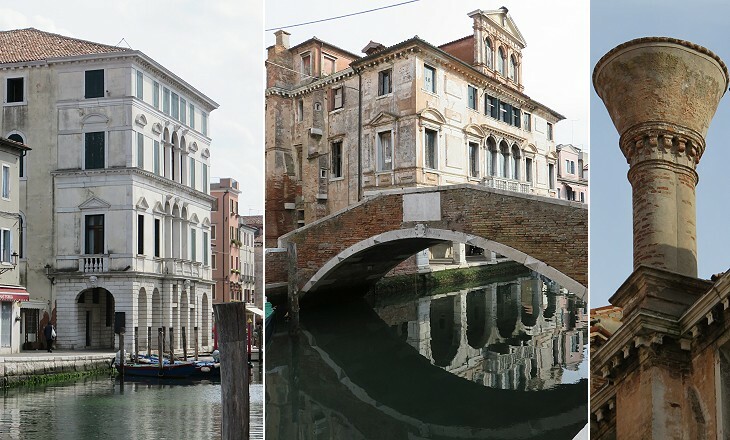 They are best known for Palazzo Grassi on the Grand Canal which today houses art exhibitions (you may wish to see its website - it opens in another page). Palazzo Lisatti Mascheroni was built in 1560 and it was owned by many families. Today it is badly in need of a thorough restoration. Palazzo Grassi was built in 1703-14 by architect Andrea Tirali (the same individual who designed the gate of Forte San Felice). It included a garden with statues and a second building at its end. In 1855 it was turned into a hospital and a new wing was built on part of the garden. 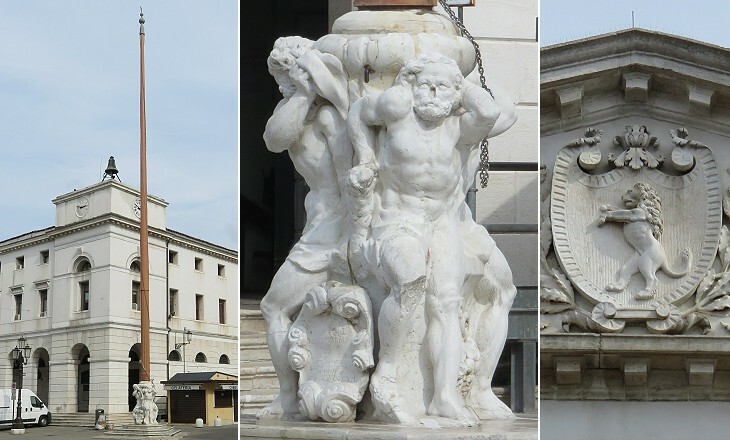 It was used as a hospital until the 1990s when it was given to the University of Padua. A thorough restoration of the surviving historical parts of the building was recently completed. Apart from Ponte di Vigo all the other bridges crossing Canal Vena were designed according to the same pattern. Two of them were built in the XVIIIth century and bear a coat of arms or an inscription related to the podestà who built them. 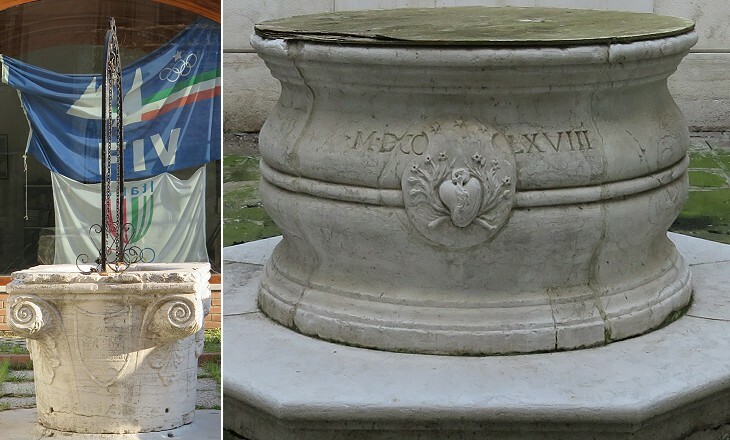 Chioggia does not have historical fountains because water was supplied by deep wells. Similar to those in Venice (and Corfu) they were carefully designed and decorated with coats of arms or other symbols.